You will experience the true meaning of Christmas when you embark on this life-changing visit with the children of Padua House and Happy Santas. ​In a world of cynical consumerism, the simple joy on the face of a challenged child when they receive a treasured toy or badly needed item of clothing will touch your heart. The opportunity to interact directly with a child receiving your gift will be the highlight of your holiday season. ​Padua House is a residential program for those from the ages of birth to 35 with profound disabilities and intellectual challenges who are medically fragile. Happy Santas is committed to providing cheer during the holiday season to the residents and staff. ​Package levels range from $150 – $5,000+. 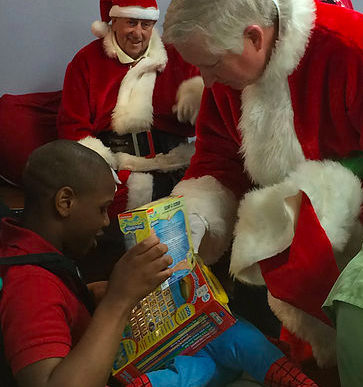 ​Happy Santas is fiscally sponsored by the Louisiana Hospitality Foundation. The 2018 Padua House visit is scheduled for Monday, December 10, 2018.